Have you ever missed out on doing something because you didn’t want to go alone? That annoying voice in my head would tell me unhelpful stories like ‘everyone else will prob know each other’ and ‘I’ll be the only one who doesn’t know what I’m doing’. Doing things on my own has always scared me. Being an introvert, walking into a room where everyone else is chatting to each other fills me with dread. What if no one talks to me and I’m stand in the corner on my own like a lemon? That’s why I make that extra effort for people to feel safe and comfortable when they come to 12 Rounds. Fun and connection are 2 of our values and helping people feel safe is my speciality. I love making sure I organise people in pairs when they come to my classes. Not only does it avoid anyone feeling like a spare part, it encourages people to get to know each other and have a bit of a laugh while their working out on the pads. Fears can control you and leave you missing out on all kinds of opportunities. But only if you let them. Like in boxing, sometimes you have to to just step forward into the shot with your guard up. Sounds counter intuitive but it takes the power right out of the shot. Same with fears. The min you face them they lose their power over you. If I’m unsure of something I know I have tendency to procrastinate and miss trains – then I can lie to myself and say it wasn’t my fault and have an excuse for why I didn’t go. Don’t let yourself off that easily! 3. Engage Don’t go in half heartedly. Challenge yourself to engage in the process. Ask questions. Get a seat at the front of the room. Introduce yourself to people. Remember everyone else is in the same boat and likely feeling the same nerves. 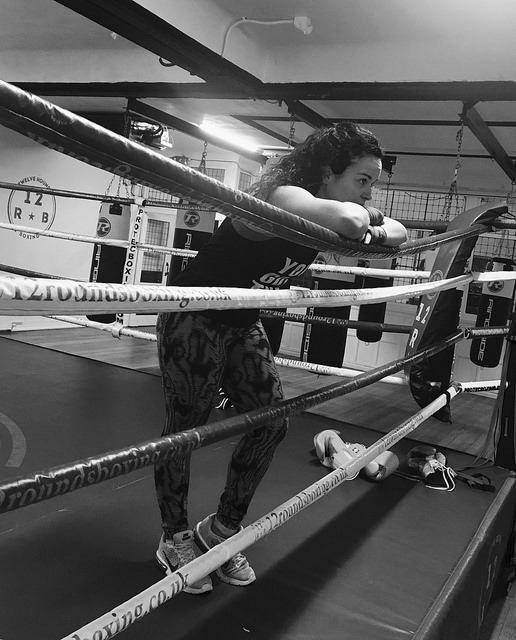 Stepping into a boxing ring and competing takes a lot of courage. It also takes courage to overcome that first hurdle and step into the gym in the first place. Don’t live to regret what you didn’t do, step into the fear and who knows where it could lead?